The National Commission for Culture and the Arts (NCCA) and the Philippine Post Office launched the Commemorative Stamp for the Centennial Birth Anniversary of National Artist for Theatre Severino Montano at the Leandro Locsin Auditorium of the NCCA on March 12, 2015. 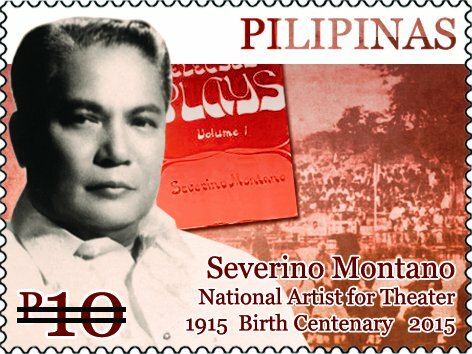 The stamp is launched in celebration of Severino Montano’s contributions in the field of Theatre Arts. He was declared as National Artist for Theatre in 2001. A celebrated thespian and playwright during the 50s, Severino Montano’s works include Sabina, But Not My Sons Any Longer, Gabriela Silang, Parting at Calamba, Speak, My Gentle Children, Lonely is My Garden, My Morning Star and the deemed longest-running play on record The Love of Leonor Rivera which is staged in more than a thousand production under the auspices of the Arena Theatre. Montano’s pioneering of the Arena Theatre has been one of the many changes in the Filipino arts scene in the 50s. It has brought theatre arts as a form of entertainment and celebration of Filipino drama to the far flung barrios of the Philippines. Arena Theatre catered to grassroots audience, bringing theatre closer to the hearts of the Filipino masses of his generation. “Severino Montano executed a large-scale feat for the small people of society and the afterglow of his works continues to light the path of the new generation of artists, poets, and playwrights.” noted Felipe de Leon Jr., Chairman of the NCCA. The postage stamp design is laid-out by Ryan Anengi and Victorino Serevo. It is available at PhilPost for 10.00 Php and is released at a limited availability for 65,000 copies. For more details on the stamp, you may reach PhilPost at 527-8327 to 30. For more information on the various National Artists, contact Ms. April Pabon of the NCCA Order of National Artist Awards at 527-2192 local 507, or visit the NCCA Website at www.ncca.gov.ph.